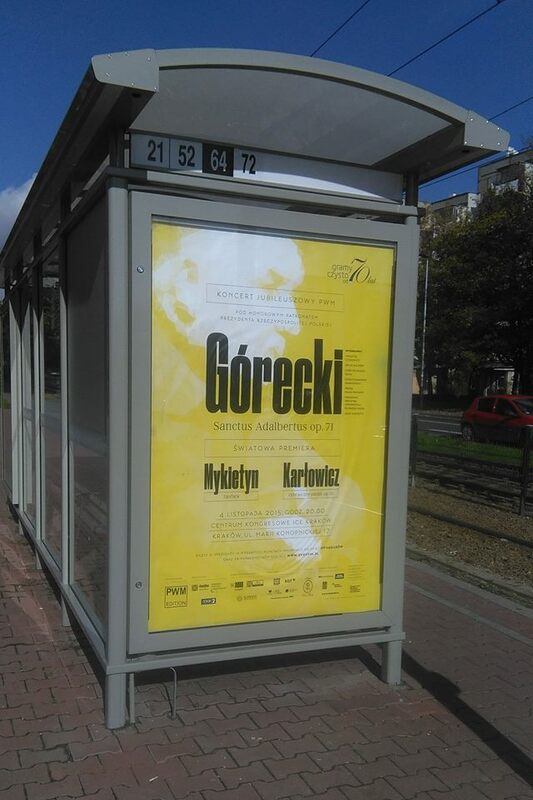 A week today – on Wednesday 4 November 2015 – the last of Gorecki’s major posthumous works will receive its first performance, in Kraków. 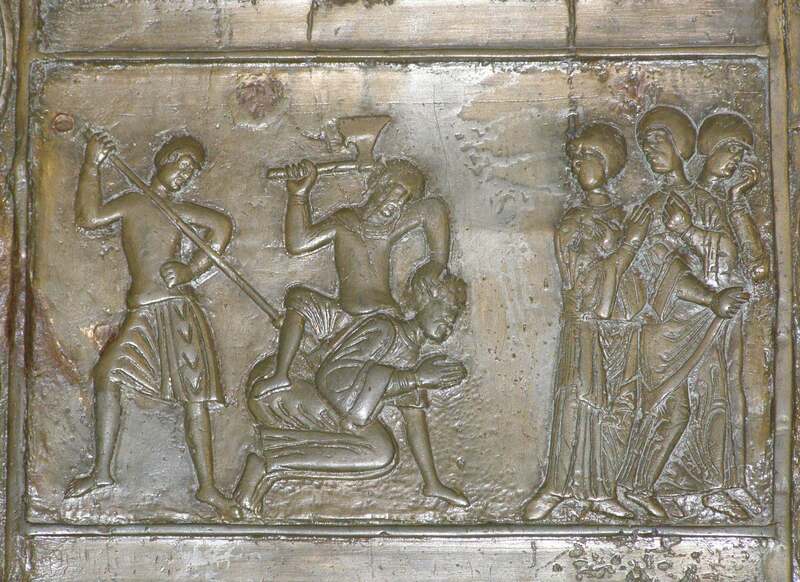 It is Sanctus Adalbertus, an hour-long ‘oratorio’ composed eighteen years ago to mark the assassination of St Adalbert in 997 (illustration above from the doors of Gniezno cathedral). Its projected premiere in 1997 fell through and he used part of the score for the final movement of Salve, sidus Polonorum (2000). This first performance follows the world premieres last year in London and Warsaw of Symphony no.4 (2006) and Kyrie (2005). The second performance will take place a week later, in Gorecki’s home city Katowice, on the eve of the fifth anniversary of his death. Kraków is awash with posters for the concert, which also marks 70 years of PWM, the music publishers to whom anyone interested in Polish music owes a huge debt of gratitude. Sadly, I can’t be there for this double celebration, but I was asked to write the programme note, which may be accessed here. The ‘Unsound’ festival in Kraków has established itself as a major force for musical exploration since its first appearance in 2006. It has since had offshoot festivals in New York, London, Adelaide and Toronto. The 2015 festival begins today, but its launch has just been tarnished by accusations of satanism against the festival and the British musician David Tibet from one of the churches in which it holds its events. 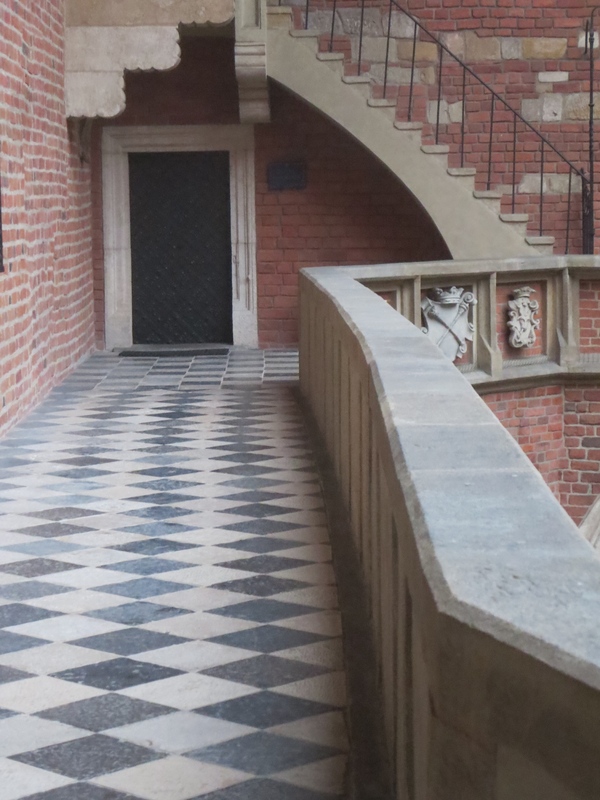 ‘Unsound’ is noted for pushing boundaries, but it has always had a friendly and cooperative relationship with Kraków churches. I know no more than what the attached press release and statement from Tibet reveal. They are remarkably restrained in tone, but it does seem from this distance that what my parents would have called ‘an interfering old busybody’ has been stirring it under false pretences. Good for ‘Unsound’ for dealing with this so coolly and with dignity and for finding another venue for this already sold-out event by Tibet’s group ‘Current 93’ next Friday. See also the 2015 Festival/Events side-bar for the link to Unsound. With great shock, it has come to our attention that accusations have been posted on a Polish Internet website that our festival — as preposterous as it is to even repeat — allegedly promotes and propagates Satanism. These accusations, initially made in a letter to St Catherine’s Church, are completely unfounded, unreasonable, and slanderous. They undermine the good name of the festival, which since 2003 has been an enthusiastic participant in Krakow’s cultural life, and we reject the accusation unequivocally. Were it possible to ignore this as a sick joke, we would. Unfortunately, this statement harms not only the festival organisers, but also our guests – including both artists and the festival audience. As the organisers of Unsound, we of course categorically deny that Satanism is now or has ever been promoted at our festival. The goal of the Unsound festival has always been bringing artists and audiences together in the promotion of art and culture. There has never been any political ideology or religious motivation behind the festival programming. 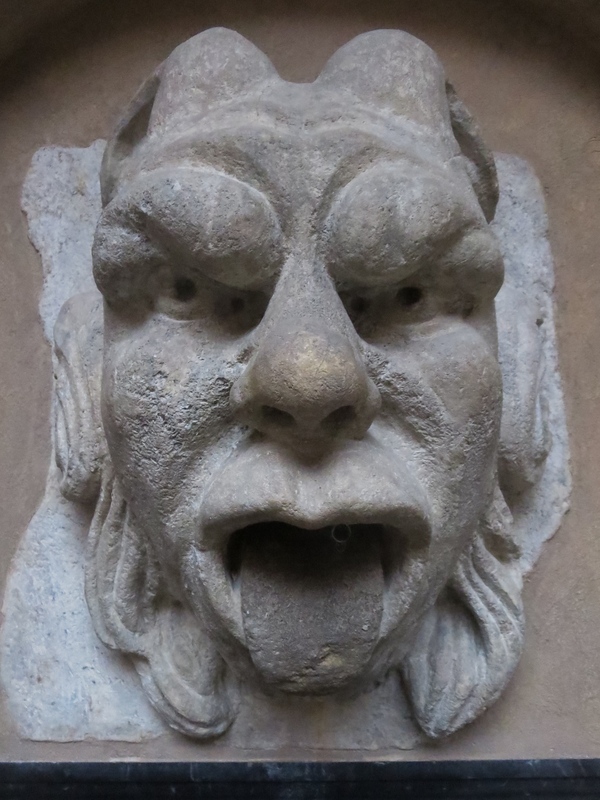 And, moreover, the organisers of the festival have always appreciated the hospitality of Krakow churches, where over the span of several years many concerts have taken place. Today, Unsound is an important international cultural event, which brings many wonderful artists and thousands of national and international attendees to Krakow. The attention it garners across the globe also brings increasing interest and curiosity about the city and all it has to offer. In regard to people who spread harmful and untrue accusations about the festival and its participants — whether out of spite or extreme ignorance, we do not know — we invite them to Unsound to discover what its main goals actually are. We received a message from St. Catherine’s Church that they have been asked by the curia to cancel the concert of Current 93, which was meant to take place there on October 16th. We are especially sorry because David Tibet — the founder and leader of Current 93 — sent us a statement in which he explains his faith as a Christian, as he has many times in interviews. This letter was forwarded to the church, but without effect. He is upset and hurt by the fact we are now forced to change venues. Below we have published a brief statement from David Tibet. My friends Mat Schulz and Gosia Płysa at Unsound informed me of some crazy allegations against me and my work, accusing me of being a Satanist and other such ridiculous slanders. I have declared many times that I am Christian. Nearly all of my work manifests this belief, both my music and my artwork — and this conviction remains no less true even if my work often displays a dark humour — as well as my studies, including those in Coptic, which I learnt in order to work on apocryphal New Testament texts. My lyric book, SING OMEGA, is dedicated “to Yesu the Aleph, the Secret Lion”. Indeed, the title of the book is taken from a homily by the Coptic monk Shenoute, quoting the Coptic monk Pachomius. My work may sometimes be unorthodox and misunderstood by those holding different views to my own, but I have stated on many, many occasions that I am Christian. I would like to thank Mat, Gosia and all of those at Unsound, who have responded to this small, and stupid, set-back with generosity and determination, and I and all of C93 look forward to seeing you in a different venue on the same night! With Love and Chariots, and Watch and Pray! • John Tilbury – One of the foremost pianists in the world of experimental and improvised music. He is playing with one of Poland’s leading experimental musicians, Robert Piotrowicz. • Raphael Rogiński – One of Poland’s most famous jazz and improvisational guitarists, who is playing the music of John Coltrane, as heard on his recent Bolt Records release. • RRose plays James Tenney – The U.S. musician Rrose will play a piece by renowned American composer James Tenney on a 32-inch gong. Once again, we would like to state that Unsound — an open-minded festival dedicated to the promotion of music and culture — is not guided by any political or religious agenda. Our audience and the artists who play for them are made up of people with many different beliefs and world views — they are all joined together by music. News on alternate venues will come soon. We are also working to confirm an alternate venue for the Current 93 show. We will share this information as soon as we have it. For the second of five articles on Panufnik’s revisions made after he had fled to England in 1954, I have combined two works from 1947: Nocturne and Lullaby. They remain two of his most enduring compositions, and Lullaby in particular has recently won a new following. Nocturne is also a special piece and was subsequently held up by commentators as a pre-echo of the sonoristic developments in Polish music in the 1960s. Curiously, Panufnik chose in his revisions of both pieces to cut out textural features that might have cemented this link to younger composers back in his native Poland. Click here for the link to the article on Nocturne & Lullaby. P.S. I have not yet discovered why Nocturne was first published as Notturno. Does anyone out there know? 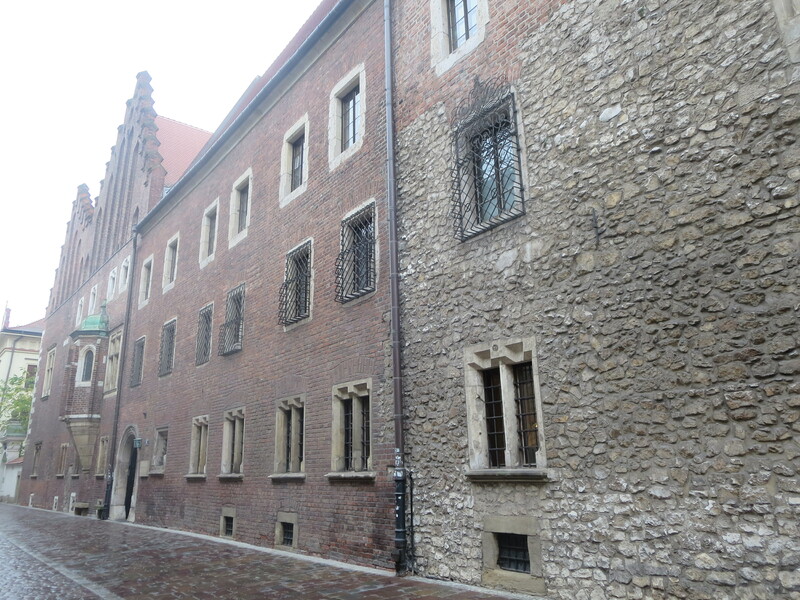 My favourite building in Poland: the fourteenth-century Collegium Maius of the Jagiellonian University in Kraków. Even on a wet, colour-draining November day, it is still magnificent. One of Lutosławski’s forgotten works is his Overture for strings, premiered on this day 64 years ago in Prague, by the city’s Radio Symphony Orchestra under the Polish conductor, and Lutosławski champion, Grzegorz Fitelberg. It seems to have been the Overture’s fate to have been composed just as socialist realism was taking a firm grip on Polish music. Yet there seems to be no record of it having been banned or criticised. 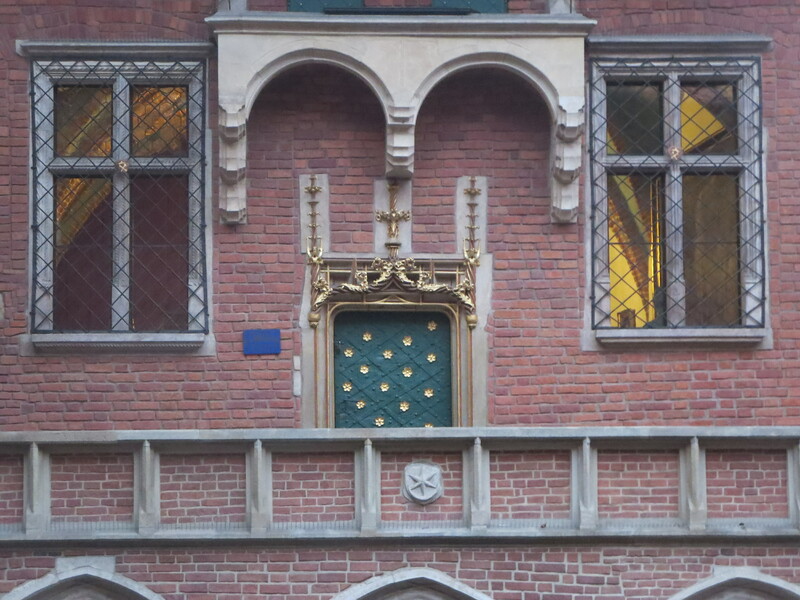 Even though it kept its distance from the simplicity apparently being required of Polish composers – it uses an octatonic scale and has some intriguing metric subtleties – it seems simply to have disappeared, perhaps regarded as irrelevant rather than dangerous by those with programming power. Perhaps Lutosławski himself put it to one side; he appears never to have conducted it, and during his lifetime there were only seven performances (according to Witold Lutosławski. A Bio-Bibliography). There have, however, been five commercial CD recordings. On one of my antiquarian forays in Kraków I came across the concert programme for the Overture’s first performance in the city (it looks as if it was also the Polish premiere). It took place two months after the Prague performance, with the Kraków PO conducted by Witold Krzemieński. 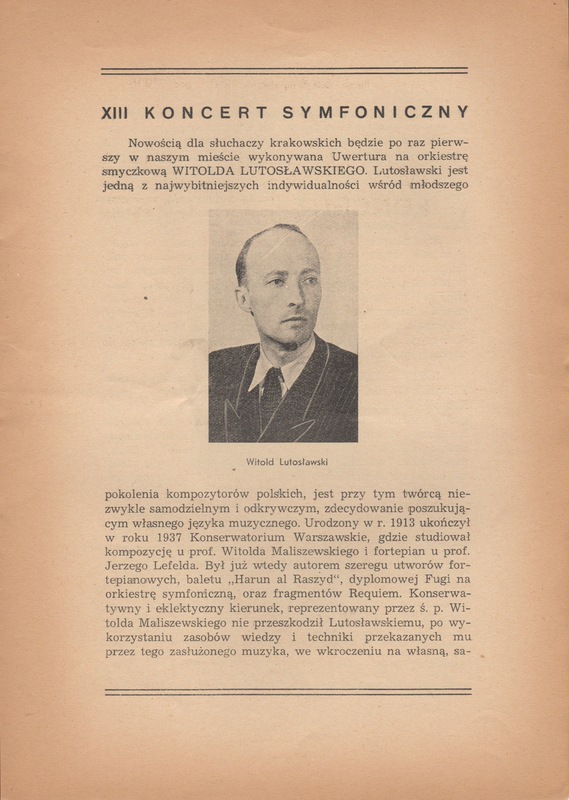 The relevant pages of the programme are reproduced below, including another profile of Lutosławski – see an earlier one in WL100/54: Lutosławski and Panufnik (1945) – that sheds new light on Polish perceptions of the composer in the immediate post-war years (my translation is at the foot of this post). There is, however, no hint in the note of state pressures for socialist-realist music, even though the concert took place just five months after the coercions unveiled at the August 1949 composers’ conference in Łagów and less than two months after official censure of his First Symphony at the Chopin Competition in Warsaw. 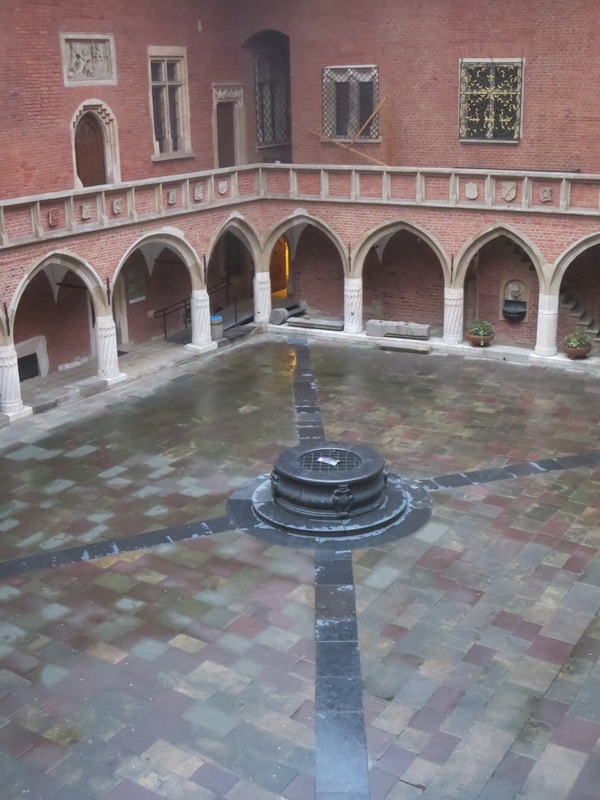 But Kraków was always at one remove from the capital, which is possibly why the Polish premiere took place there. P.S. This wasn’t the only time that a new Lutosławski piece shared the billing with Borodin’s Second Symphony. The same was to happen in 1970 at the premiere of the Cello Concerto. New to Kraków listeners will be the first performance in our city of the Overture for string orchestra by WITOLD LUTOSŁAWSKI. Lutosławski is one of the most outstanding personalities among the younger generation of Polish composers, through the creation of an exceptionally independent, insightful and decidedly exploratory musical language of his own. Born in 1913, in 1937 he completed his studies at the Warsaw Conservatoire: composition with Prof. Witold Maliszewski and piano with Prof. Jerzy Lefeld. He was by then already the composer of several pieces for piano, the ballet Harun al Rashid, a Fugue for symphony orchestra for his diploma, together with fragments of a Requiem. The conservative and eclectic direction represented by his distinguished professor, Witold Maliszewski, did not prevent Lutosławski, after utilising the fund of knowledge and technique passed on to him by this worthy musician, from stepping out onto his own, independent artistic path. The main stages of this path, a path on which Lutosławski gradually but consistently and steadily became independent and radicalised his musical language, were: Symphonic Variations (performed in 1938 at the Wawel Festival [it was actually in 1939: see WL100/43: Variations, **June 1939]), Etudes for piano (1943 [actually 1941]), Trio for oboe, clarinet and bassoon (1945) and finally the Symphony (1947). His last major piece is this very Overture for string orchestra, performed for the first time under the direction of Grzegorz Fitelberg in Prague, Czechoslovakia (October 1949 [actually, November]). Lutosławski’s musical style is characterised by a desire for logic, economy and formal rigour, an inclination towards polyphonic texture, and lastly his own harmonic world, in which one senses throughout the basis of a modern and at the same time spontaneous and individual sound of ‘the new order’. When it comes to the orchestral palette, which Lutosławski deploys masterfully, since the orgiastically colourful Symphonic Variations there has appeared in his work a marked return to greater economy, and even instrumental asceticism (Wind Trio). Here are two forgotten assessments of Lutosławski and Panufnik from 1945. I think that this is the first time that this material has been seen in modern times. 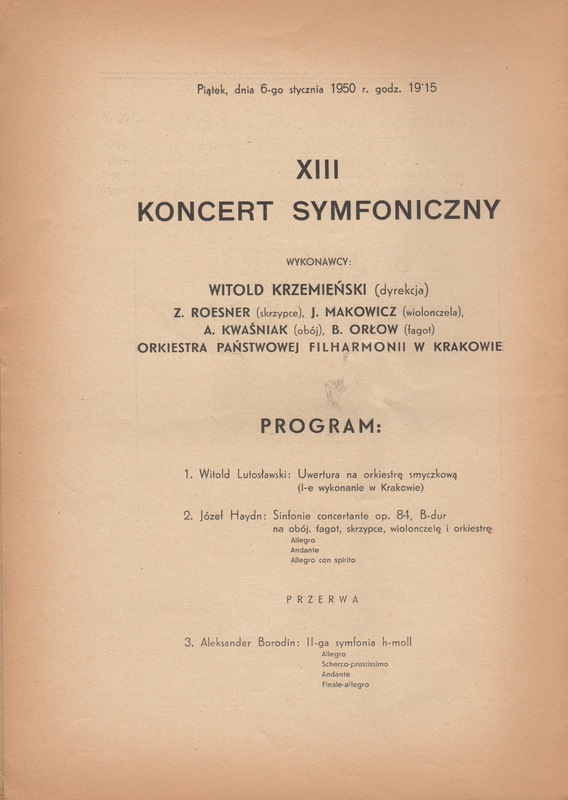 On one of my rummages in second-hand bookshops in Kraków, back in the 1990s, I came across a bundle of concert programme, one of which I featured in an earlier Lutosławski post: WL100/43: Variations, **17 June 1939. This second programme, which I explored in the preceding post WL100/53: Trio, **2 September 1945, has the biographies of the five composers on the back page. In fact, the biographical elements on Lutosławski and Panufnik take second place to assessments of the composers’ creative personae. It is not indicated who wrote them. I’ve translated the two for Lutosławski and Panufnik below. WITOLD LUTOSŁAWSKI b. 1913 represents the youngest generation of Polish composers and, among them, the direction of the “extreme left”. This avant-gardism expresses itself in Lutoslawski in the openly fanatical pursuit of logic and rigour in the design of his prevailing use of polyphony as a means towards these goals, searching absolutely for his own sound world, as far removed as possible from that used by previous generations of composers. It is especially interesting to find that this avant-gardism appeared in Lutoslawski independently, as an expression of his own internal needs. During his studies he found no external stimulus in this direction, nor did the environment in which he grew up and was educated have the slightest intrusive impact. He completed his music studies at the Warsaw Conservatory in the class of Witold Maliszewski, one of the representatives of the most conservative tendency among our composers and teachers. Among the most important works by Lutoslawski we may mention: Piano Sonatas (which he has performed several times), Symphonic Variations (performed at the Wawel Festival in 1939), Variations on a Theme of Paganini for two pianos, fragments of a Requiem, piano pieces and songs. Currently he is working on a symphony, of which the first movement is already fully completed, the rest in sketches. This biography is fascinating for several reasons: (1) the placing of Lutosławski as a radical “extreme left” composer on the basis, presumably, of his main composition so far, the Symphonic Variations, (2) the early indication of his life-long desire for logic and rigour, (3) the emphasis on polyphonic writing (with only a few pieces as evidence) as distinct from the later emphasis on harmony, (4) the strong statement about Lutosławski’s independence from external sources and events (something which he reiterated over and again until the end of his life), and (5) the deliberate distancing from his teacher Maliszewski, whom later he often cited as a key influence on his structural thinking while recognising Maliszewski’s disapproval of the Symphonic Variations. Given the strength of opinion expressed in this paragraph, it wouldn’t surprise me at least if it was written by the unknown author on the basis of a detailed briefing from the composer. I don’t have the feeling that Lutosławski penned it himself (see the error mentioned in the paragraph below). The list of works curiously multiplies the Piano Sonata. This is the only time that I have read any suggestion that there might be more than one! It also reveals where Lutosławski was in the composition of the First Symphony (1941-47). We may now date the completion of the first movement as by August 1945 at the latest, with the other three movements being finished over the following two years. ANDRZEJ PANUFNIK, whose “Tragic Overture” was such a success in Kraków’s last concert season*, is the second strong supporter – alongside Lutosławski – of radical trends among our youngest composers. And with him at the forefront, the quest for the greatest formal logic is advancing, and for the most part he experiments with clearly positive results in the pursuit of a new musical language. At the same time, a very specific note of lyricism is revealed in his music, which gives his pieces the most distinctive physiognomy. Panufnik is the author of: Variations for piano, Trio for violin, cello and piano, Folk Songs with wind instr. accomp., Songs with chamber orchestra, “Tragic Overture”, Orchestral Variations, Symphonic Image and two symphonies. As an outstandingly gifted conductor himself, he is the best performer of his symphonic works. In recent times, he has worked regularly with the Polish Film Unit in Łódż. Panufnik’s biography is interesting for largely different reasons. He has long been regarded as the most experimental Polish composer of the second half of the 1940s, so it is fascinating to see that he already bore this mantle in 1945 with a work like Tragic Overture (1942, reconstructed 1945) and that the lyrical side of his music achieves prominent notice at a moment when he was focusing on tight motivic cells. The list of works includes some that had been lost during the Second World War and have generally been left out of his list of works since, including his early student Variations for piano, the Symphonic Variations – which Panufnik had conducted in the graduation concert – and Symphonic Image (both works were composed during Panufnik’s last year at the Warsaw Conservatoire, 1935-36) as well as the two symphonies (1940, 1941). ** The Songs with chamber orchestra are unidentifiable. * The dates of the wartime premiere in Warsaw of Tragic Overture vary according to the source: the Polish Encyklopedia Muzyczna and Panufnik’s autobiography Composing Myself give 1943, while the monographs by Beata Bolesławska and Ewa Siemdaj give 19 March 1944. As to the premiere in Kraków of the reconstructed score, Siemdaj gives 10 January 1946, but this leaflet indicates that it was given sometime during the 1944-45 season. ** In his autobiography, Panufnik noted: ‘I then decided to try to rescue my Symphony no.1. But here my memory faltered and the results were disappointing. I performed it in one of our symphony concerts, but afterwards destroyed the score. 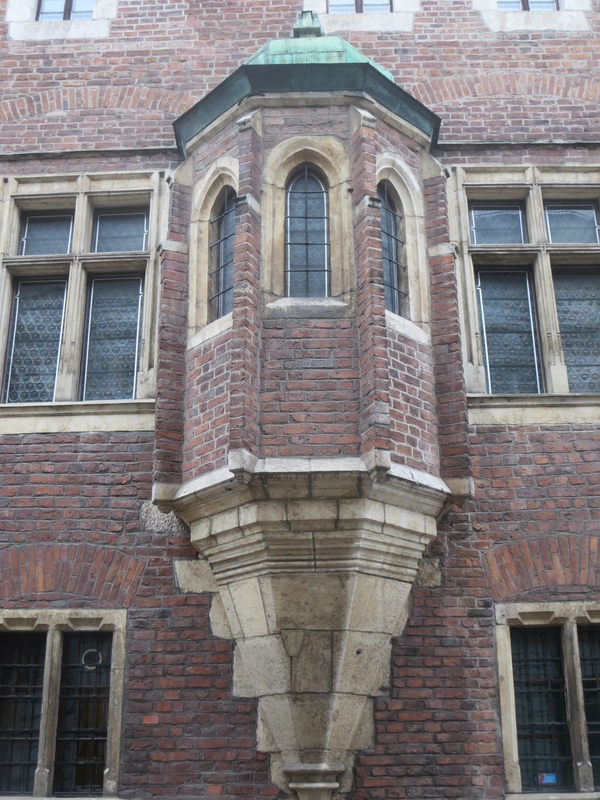 With that I renounced further reconstruction work…’. Concert programmes from Kraków indicate that Panufnik conducted the premiere of his reconstructed First Symphony on 30 November 1945, and again on 6 December. With this programme leaflet, the precise date of the premiere of Lutosławski’s Trio for oboe, clarinet and bassoon (1944-45) can be determined. 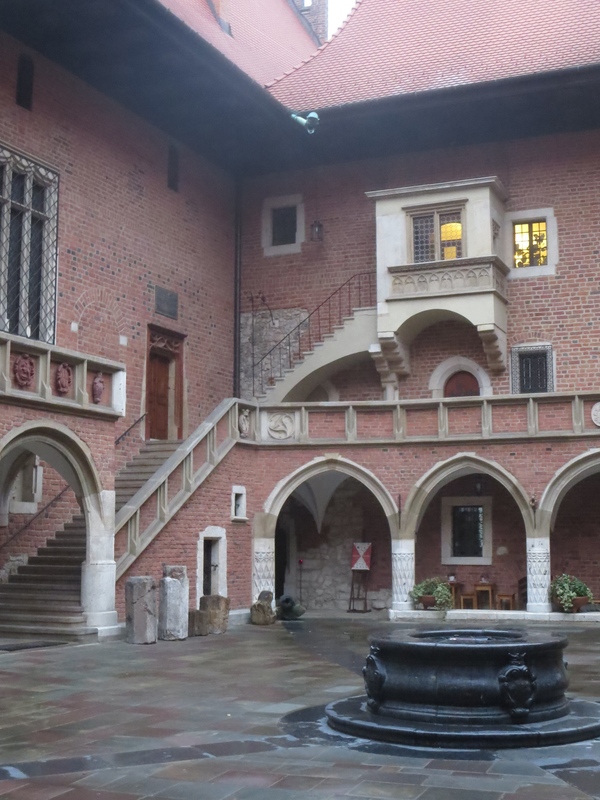 It has long been known that it was given its first performance in Kraków during the Festival of Contemporary Polish Music (1-4 September 1945). 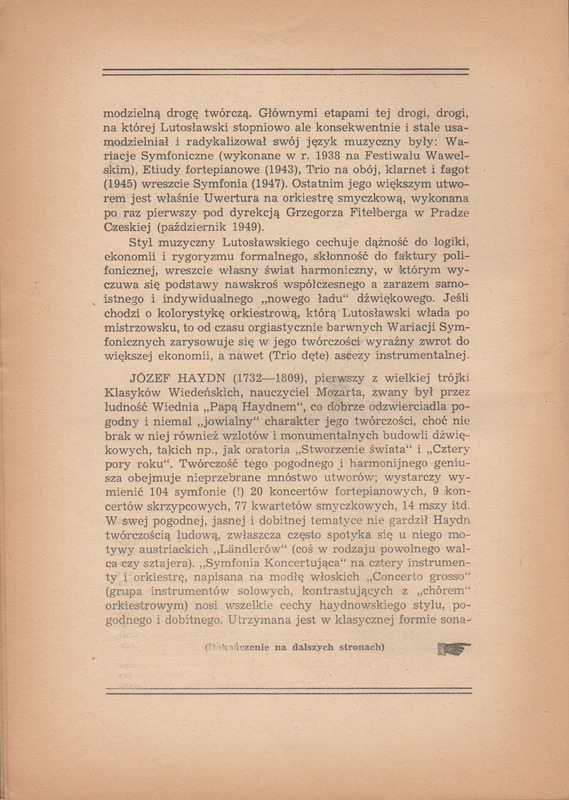 This leaflet indicates that the premiere was on Sunday 2 September, which was also the final day of the Congress of the Union of Composers (subsequently known as the Union of Polish Composers, ZKP), held 29 August – 2 September to galvanise Poland’s musical life in the immediate post-war months. Lutosławski was appointed Secretary-Treasurer of the new union during the congress. The programme of this Chamber Concert does not specify that this was the premiere of the Trio, but then it also fails to do the same for at least one of the other pieces. The previously understood details of the premiere of Andrzej Panufnik’s Five Folk Songs (later known in English as Five Polish Peasant Songs, 1940, reconstructed 1945) were only that the piece was premiered during this festival under the young conductor and composer Stanisław Skrowaczewski (b.1923). The details here give not only the date, but also the full complement of players, under a different conductor and composer, Artur Malawski (1904-57). Also in the first half of the programme were several piano pieces by Jan Ekier (who celebrated his 100th birthday four days ago), most of them written before the war. The second half of the programme focused on Roman Padlewski (1915-44) , whose death in valour during the Warsaw Uprising in August 1944 was one of the greatest losses to Polish music during the Second World War. Padlewski’s first and third string quartets were destroyed during the Uprising, but the Second Quartet (1940-42) survived. I don’t know if it was performed in one of Warsaw’s secret concerts during the war or whether this was its premiere. It was preceded here by Tryptyk żałobny (Mourning Triptych), by Tadeusz Kassern (1904-57), which was based on melodies from a 16th-century hymnal and dedicated to Padlewski’s memory.